We started the day at about 7:30, we actually woke up around an hour earlier but we were about the last peregrinos to leave the albergue Villadangos del Paramo. It was a slow start to the day; Jessica was in pain within 5 kilometers. We stopped for bread, croissants and a couple of other items. We rested often; Jessy finally took my pain pills which are also for infection. Within half an hour she was feeling better, she also followed it up with her own infection medicine. A little later at a church courtyard we had a snack and from there we went at Jessica’s pace. 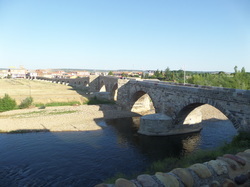 We had a slow ride into Astorga, I felt that would be Jessica’s limit but she felt better and continued to ride. After fixing another flat we rode into Rabanal del Camino. I felt that we were still four days from finishing our Camino, A German guy I spoke earlier in the day felt we would have enough time to make it, he was also on a bici. We stopped and had a nice dinner of chicken and pasta. We paid the eleven Euros for the peregrino dinner but ended up splitting the meal. As we had dinner we watched Mexico beat Cameroon in the world cup at the restaurant/bar. We went back to our albergue and washed our clothes in a washer and hung them out to dry on clothes lines. We are in the albergue municipal of a very small village; we are told it is the 25th oldest albergue on the Camino. It is a quite rustic looking; I would say that the town consists of about 75% peregrinos to the town’s people. Later on that evening I go up to the bar to watch the Germany game with a German that is doing the Camino. He tells me that he is really not a soccer enthusiast but it is the world cup and it is his duty to watch. We shared stories about growing up in a communist country, he had grown up in East Germany for 10 years prior to the wall coming down. I lived in Castro's Cuba for 9 years before my family's move to America. He has invited us to come visit him in Berlin on our next adventure to Europe. Jessy stayed behind and got some WIFI time. Thought on today’s ride – We can take the smoother road up the mountain, but most likely it is longer or we can take the shorter, but it will be steeper with more challenges.